Run Time: 169 min (Theatrical), 182 min (Extended Edition), Rated PG (Canada), Rated PG-13 (MPAA) for extended sequences of intense fantasy action violence, and frightening images. In preparation for the release of this month’s The Hobbit:The Desolation of Smaug (2013) a closer look at An Unexpected Journey(2012) is in order, especially since the first Hobbit movie was just released in an extended version with lots of great extras and behind-the-scenes insights. Many Christians as children read J.R.R Tolkien's book The Hobbit and were enthralled by its adventure and characters from the Hobbit Bilbo Baggins, to pitiful Gollum, to the Dwarf king-in-waiting Thorin Oakenshield and his twelve faithful companions, and the greedy dragon Smaug. Part of what makes it fascinating is how the author’s faith comes through in his work even when he wasn't trying to write a Christian book. Since the films stick relatively close to the book Christians will find certain things in The Hobbit films—or The Lord of the Rings films for that matter—that have scriptural significance, things that resonate with the Christian faith. What makes things a bit more complicated and fascinating is that Tolkien wasn't a fan of allegory. In fact, in a radio interview for the BBC radio program Now Read On…(1964)when asked by host Dennis Gerrolt if his stories were "to be considered as an allegory?" Tolkien answered, "No. I dislike allegory whenever I smell it." However in the same interview Tolkien speaks of how things are ‘reminiscent’ of other things, not a one-to-one parallel in a classical allegorical fashion but certain things will ‘remind’ the reader of other things, and in a number of those cases Christian readers will be reminded of scriptural things. What Tolkien is talking about is more like symbolism than allegory. From the Now Read On… radio interview we find this interesting exchange. Gerrolt asks "Did you intend in Lord of the Rings that certain races should embody certain principles: the Elves wisdom, the Dwarves craftsmanship, Men husbandry and battle and so forth?" "The Dwarves of course are quite obviously — wouldn't you say that in many ways they remind you of the Jews? Their words are Semitic obviously, constructed to be Semitic." Knowing that Tolkien said this about his Dwarves unlocks a number of interesting possibilities for Christian viewers of The Hobbit: An Unexpected Journey as it seems to have had some influence on Peter Jackson and his writing team, even though the decisions they made while writing the script and filming the movie may press closer to allegory than Tolkien would have liked. This allegorizing likewise seems to favour elements of the Christian worldview at the heart of Tolkien's writing making the film maker’s creative choices feel faithful even when they depart from the letter of Tolkien's written words. The prologue of the film sets the stage: The older Bilbo Baggins (Ian Holm) recounts how a group of the Dwarves living in Erebor, a solitary peak also called the Lonely Mountain, amassed great riches and became the object of Smaug's greed "for dragons covet gold with a dark and fierce desire." Smaug, the dragon, takes the riches by force and “robbed of their homeland, the Dwarves of Erebor wandered the wilderness, a once mighty people brought low." This prologue is not found in the book the way it's presented in the film. For the most part large sections were derived from Tolkien's other writings not found in the Hobbit.The choice of using phrases like "robbed of their homeland" and "wandering the wilderness" evoke imagery Christians would associate with the Jewish people of the Old Testament when the Children of Israel were wandering the wilderness prior to entering the Promised Land or when they were in exile in Babylon having been "robbed of their homeland" by force. In the first case Christians will remember how a warrior leader, Joshua, takes the twelve tribes of Israel into the Promised Land to win what was promised to them. In the second case, almost a thousand years later, individuals like Ezra and Nehemiah return from Babylonian exile to their homeland with the purpose of restoring their Promised Land to its former glory both spiritually and materially. In Scripture the Babylonian exile was the result of the Children of Israel turning in on themselves and away from God. InThe Hobbit: An Unexpected Journey the Dwarves experience their exile as a result of King Thrór's "love of gold [which had] grown too fierce" and had become a "sickness of the mind." This sin of personal greed then broke friendships and brought disaster. In the film’s prologue Bilbo states, "where sickness thrives, bad things will follow"—a statement that sounds a lot like the warning found in the Biblical letter of St. James, "Then desire when it has conceived gives birth to sin, and sin when it is fully grown brings forth death." In the film’s prologue we learn that Thrór's covetous greed, when it was fully grown, brought down Smaug the dragon upon the Dwarves and with Smaug came death and destruction. In 1955,years before Tolkien's Now Read On… radio interview, he wrote a letter to Scottish novelist and poet Naomi Mitchison saying that he'd "thought of Dwarves like Jews, in that they were both native and alien in their habitations, speaking the local language but with an accent since they had a private tongue." It's good to keep in mind that The Hobbitwas published in 1937 before World War II, the Nazi Holocaust and the formation of the modern nation state of Israel 1948-1949, — a time when the Jewish people of the world were a people without a homeland or at least people long displaced from the land which they once held. His subsequent comments following the formation of the state of Israel, clearly assert his idea that the Dwarves are “reminiscent” of the Jewish people. On a number of levels film director Jackson also seems to make these connections and not just in the presentation of the general premise of the story but in the way he presents his villains and heroes. A good example is Jackson’s incorporation of Azog the Defiler (Manu Bennett) into the film. It's smart to provide a villain for your protagonist in a big-budget film and since the book’s central protagonist Smaug the dragon wasn't really going to be fully revealed in the first film, it needed a villain. 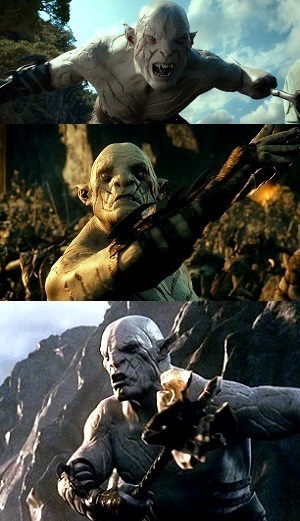 There are a couple of interesting things to consider with Azog. First, Jackson knows he's making a departure from the book by adding this Tolkien character. The way Jackson expands and changes the character of Azog in this film is similar to what he did with the character of Arwen in The Lord of the Rings trilogy of films. In the case of Azog Jackson found and developed an antagonist with a personal vendetta against Thorin; a villain who gives pursuit and provides energy and suspense to the unfolding story. Second, Azog is described as being a Pale Orc who "had sworn to wipe out the line of Durin." By setting things up this way Jackson places a threat of genocide on the Dwarves. All of this works to heighten the dramatic tension of the first act of Tolkien's three-act story as told by Jackson. Great Goblin: "Well, well, well... look who it is! Thorin, son of Thrain, son of Thrór, King Under the Mountain!" [bows mockingly] "Oh, but I'm forgetting, you don't have a mountain, and you're not a king, which makes you nobody, really." In the film The Hobbit: An Unexpected Journey as Thorin Oakenshield (Richard Armitage) fights his way toward his Dwarfish promised land he is reminiscent of the biblical warrior Joshua and as he presses forward with the desire to restore Erebor to its former glory he is reminiscent of both the biblical Ezra,the keeper of the people's history, and Nehemiah, who returns to Jerusalem from exile with the hope of the rebuilding what was destroyed. Quite apart from this, in some ways Thorin is also reminiscent of Jesus. Tolkien makes Thorin the leader of twelve other dwarves who represent Durin's Folk, which is reminiscent of Jesus and His twelve apostles who are taken from amongst the Children of Israel. Jesus says of Himself, “Foxes have holes, and birds of the air have nests, but the Son of Man has nowhere to lay His head,” and neither does Thorin Oakenshield. Unlike Bilbo Baggins and Bag End, Thorin and his twelve companion Dwarves have no comforts of home. Thorin is also single-mindedly driven to go to his lonely mountain, Erebor, where he will be king. This is reminiscent of Jesus setting His face like a flint as He makes His way undistracted and with great purpose to His lonely mountain, Golgotha, the Place of the Skull, where He would be enthroned in His crucifixion as King of kings and Lord of lords with a crown of thorns upon His brow. Thorin, like Jesus, is shown to have great determination. Keeping all of this in mind, is Thorin of The Hobbit: An Unexpected Journey the same as the Thorin in the book? Not exactly. Jackson presents Thorin as younger, more noble from the onset, more congenial and less greedy than the way Tolkien presents him in the book. Thorin's personal greed and his resentment of Smaug and everyone who failed to help his people sets Thorin apart from the Jesus of Scripture. Additionally, Jesus' kingdom is not of this worldwhile Thorin's Kingdom of Erebor at the Lonely Mountain is very much of Tolkien's fictional world and in the end, armies will fight for it.Here it is easy to see how Tolkien was not making Thorin into an allegorical representation of Joshua, Ezra, Nehemiah or Jesus while on the other hand Jackson is imbuing Thorin with qualities more reminiscent with aspects of these individuals found in Scripture. What about Thorin's greed as depicted in the book? Will it show up in the films or has Jackson scrubbed it out of the story? It's anticipated that Thorin's greed will become more apparent as the trilogy of films progresses. This can already be seen in the trailer for The Hobbit: The Desolation of Smaug when Thorin menacingly bars Bilbo's path while saying "I will not risk this quest for the life of one burglar." 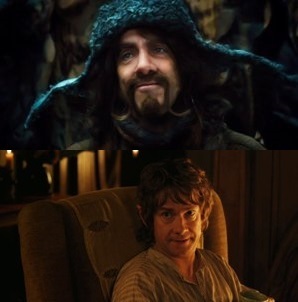 Bofur: "Where do you think you're going?" Bofur: "No. No. You can't turn back now. You're part of the company. You're one of us." 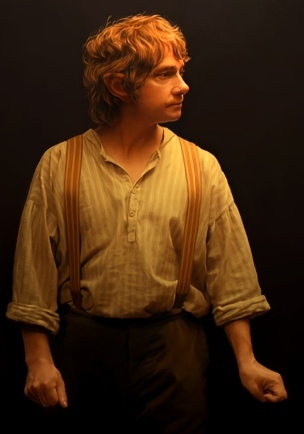 Bilbo: "I'm not now, am I? Thorin said I should have never have come and he was right. I'm not a Took, I'm a Baggins. I don't know what I was thinking. I should never have run out my door." Bofur: "You're homesick. I understand." Bilbo: "No you don't. You don't understand. None of you do. You're Dwarves. You're use to this life, to living on the road, never settling in one place, not belonging anywhere!" Bilbo: [Bofur's expression falls and immediately Bilbo realizes he has gone too far] "I'm sorry, I didn't..."
Bofur: [Bofur nods his head and looks around at the sleeping company] "No you're right. We don't belong anywhere. ... I wish you all the luck in the world. I really do." Thorin: "Forgive me for doubting you". Bilbo: "No, it's fine. I would have doubted me too." Gandalf: "Well, why does it matter? He's back!" Thorin: "It matters. I want to know - why did you come back?" 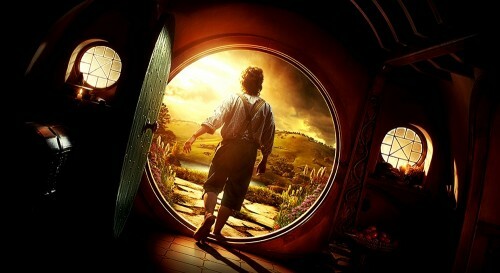 Bilbo: "Look, I know you doubt me, I know you always have. And you're right... I often think of Bag End. I miss my books, and my armchair, and my garden. See, that's where I belong, that's home. That's why I came back... 'cause you don't have one, a home. It was taken from you. But I will help you take it back if I can." With these scenes, the addition of Azog the defiler, the way the prologue is presented and with the refinement of Thorin Oakenshild’s character, Jackson has put his stamp on telling Tolkien’s story. Christian viewers will find these elements of adaptation very interesting because in part they seem to build on some of Tolkien's own thoughts and his Christian worldview. Within the film Jackson is consciously trying to walk the line between fidelity to Tolkien's written word and the general world Tolkien created, while attempting to provide a quality movie-going experience. The Extended Edition of The Hobbit:An Unexpected Journeyis an improvement upon the theatrical release. The additional scenes improve the film’s pacing and make the central protagonists, Bilbo and the Dwarves, more charming and endearing. Revisiting this first film will be a benefit moving into the release of The Hobbit:The Desolation of Smaugwhich is set for December 13th. Here Tolkien seems to be alluding to both Genesis 2:5-7 " When no bush of the field was yet in the land and no small plant of the field had yet sprung up—for the Lord God had not caused it to rain on the land, and there was no man ato work the ground, 6 and a mist was going up from the land and was watering the whole face of the ground—7 then the Lord God formed the man of dust from the ground and breathed into his nostrils the breath of life, and the man became a living creature." and Isaiah 64:8 "But now, O Lord, You are our Father; we are the clay, and You are our potter; we are all the work of Your hand." The Hobbit or There and Back Again by J.R.R. Tolkien, Harper Collins Publishers 1995, pg 22 - 24.Thorin not Bilbo recounts this information in book. The Lord of The RingsAppendix A, section III, of Return of the King under "Durin's Folk", by J.R.R. Tolkien, Unwin Hyman Limited 1988, pg 1108 - 1118. The extended version of The Hobbit: An Unexpected Journey includes more about the failing of the relationship between the dwarfish King Thrór and the Elven King Thranduil, this storyline will be picked up in The Hobbit: The Desolation of Smaug. This is clearly stated in the commentary for the extended cut of the film and in the special features produced to accompany they extended version of the film. In Tolkien's book the Great Goblin doesn't know Thorin by reputation, he only know Thorin's people by reputation. The addition of Bilbo to the company moves them from the unlucky number 13 to a more lucky number 14. The number 13 is sometimes considered unlucky because of Judas' betrayal of Jesus leading up to the crucifixion. The fact that this addition of Bilbo occurs at a supper table with Thorin Oakenshield at the head reinforces this reading of the text maintained in the film. The Hobbit: There and Back Again, (2014) the Battle of the Five Armies.